Job descriptions are quite essential for all organizations especially for the purpose of advertising to get suitable candidates for specific job positions. A job description explains the theme or nature of the job in that particular industry. It assists the potential candidates to get an idea of their roles and responsibilities and what they need to contribute towards the organization. Without a proper job description template, it is tough for the candidates to understand what is expected of them in the job. 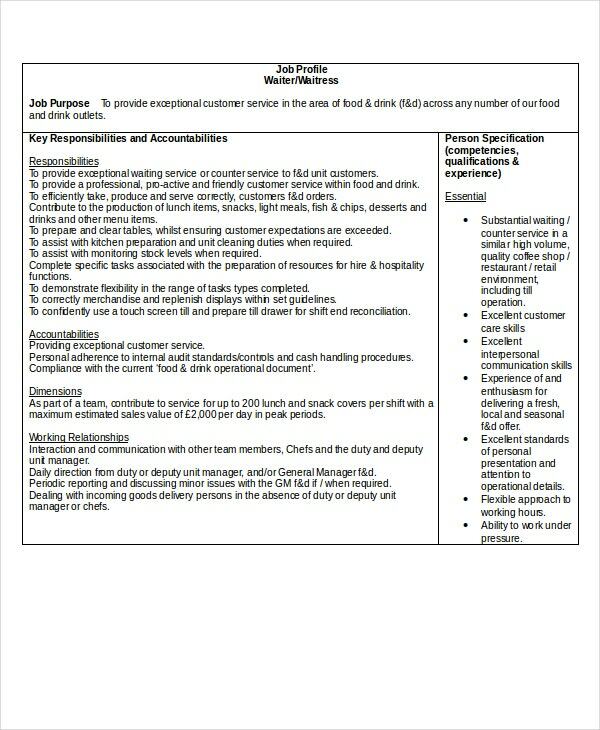 Given below is a list of waitress job description samples. If you fancy working in a nightclub or a bar as a cocktail waitress but have no idea about the various roles that are required of you, you can take help of this template. You may also check the Waitress Resumes template. If you are looking forward to working as a waitress in a restaurant, this Restaurant Waitress Job Description will be of great help for you. It will provide you all the details about the duties you will need to perform on a regular basis. 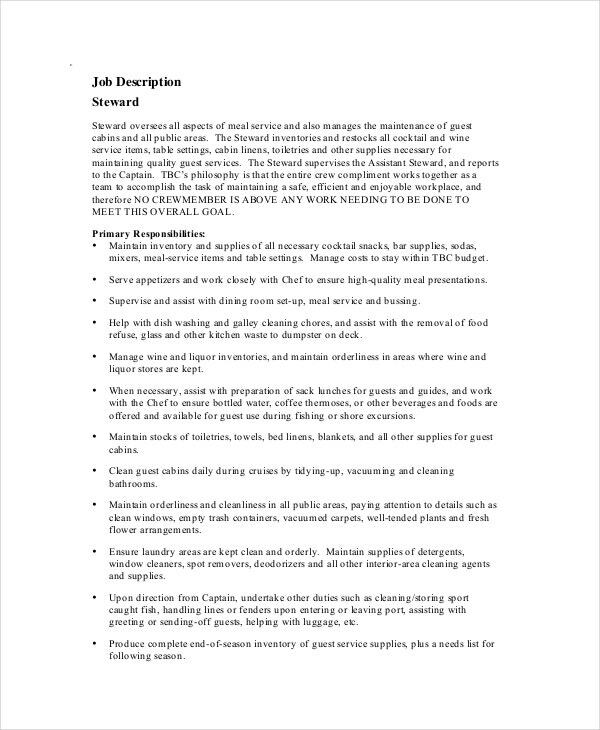 You can also see Food Service Resume Templates. 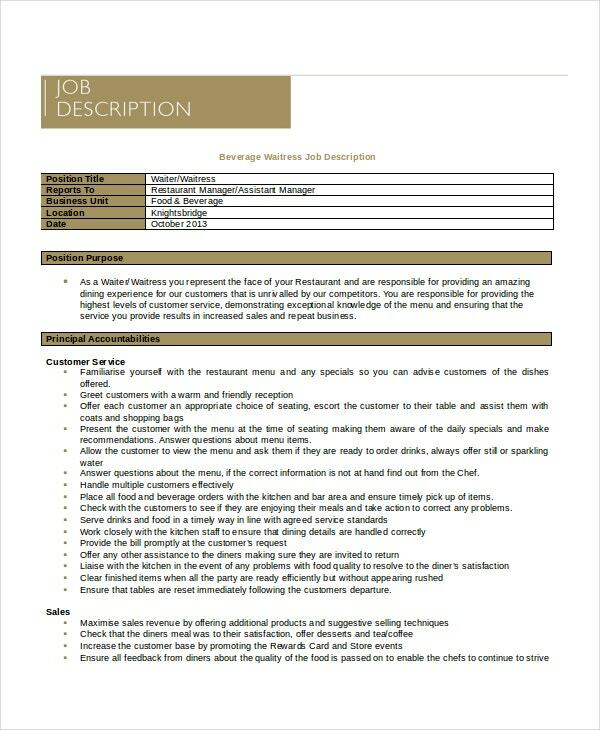 This Head Waitress Job Description template lists the tasks to be carried out by a candidate looking forward to working as a head waitress in a hotel or restaurant. This template will help her understand the roles and responsibilities inside out. > What Does A Waitress Job Description Contain? The job description of a waitress is long as she is the one who remains in direct contact with the customers and guests. A waitress performs so many tasks like welcoming the customers, taking orders, and delivering food and drinks to the customers. They also take the money and bring change for the customer. You can also see Server Job Description Templates. The waitress also ensures that the tables are cleaned immediately after the customers leave. They also intimate the customers about the unique dishes on offer and give menus to customers. The waitress also needs to ensure that everything on the table like the plates, glasses, spoons are clean. 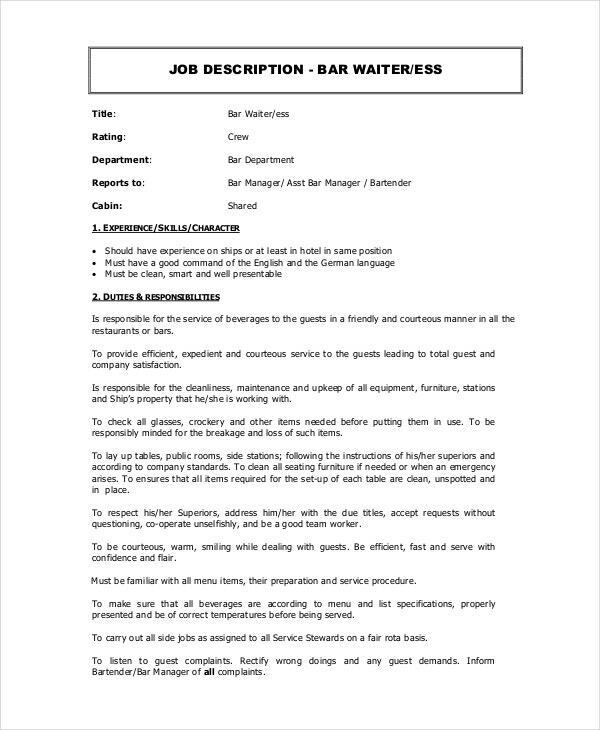 Bar Waitress Job Description template will be an ideal selection for you if you intend to work as a waitress in a bar. This template will give you a detailed idea about what all tasks you need to carry out as a bar waitress. 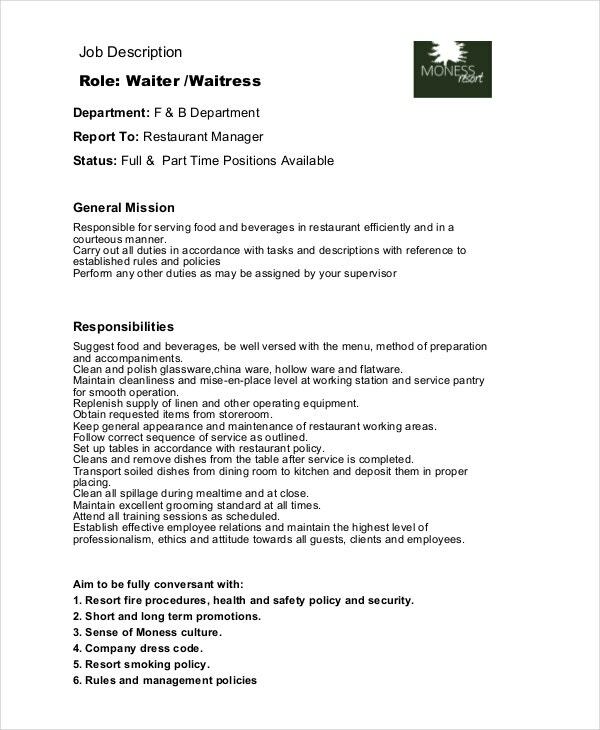 This is an ideal job description for those who intend to work in a cafe as a waitress/waiter. This will help them with all the information related to the job profile. 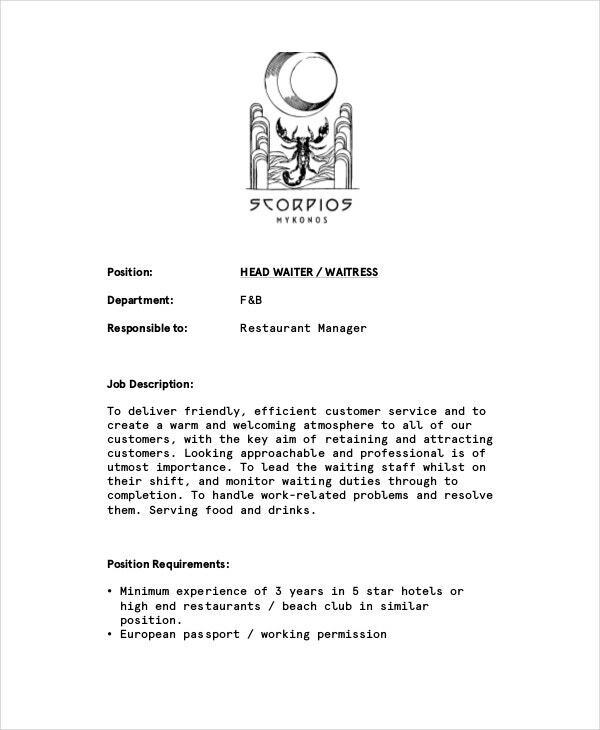 > What Are The Benefits of Waitress Job Description Templates? Every organization provides its employees with a written set of job descriptions while at work. A job description apparently lets the employees know the tasks, duties, and responsibilities they need to carry out. 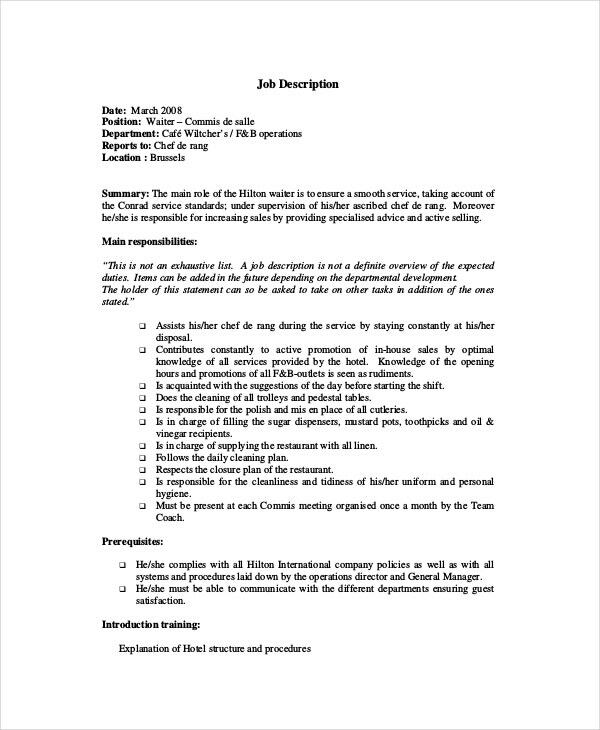 We have an extensive collection of job description templates. You can use the ones that meet your requirements perfectly.